Post #93 Poll Winner: Favorite Hair-Metal band. As the 70's turned over to the 80's, the heavy metal scene was on the brink of a new era. In Los Angeles the scene that was about to hit big was glam-metal or hair-metal. It was to be an era of heavy metal where the songs were focused less on speed and more on catchy melodies and attitude. 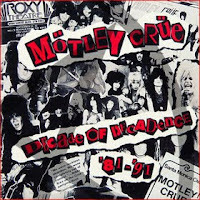 One of the first bands that developed a following and went on to be one of the most popular LA bands for the 80's was Motley Crue. Motley Crue lived the excessive lives of rock-stars to the fullest, and the lyrics of their music often reflected that lifestyle. They prided themselves on their reckless nature. For several years they attracted like-minded fans, but also wrote many catchy tunes. Their success followed the trend of their music which improved in quality with each album, culminating when Dr. Feelgood, their 5th album, reached #1 on the US Billboard charts. Shortly after, they released their first 'Best Of' compilation, Decade of Decadence, before original vocalist Vince Neil left the band for a solo career. It would be many, many years before the band would see success like this again. But this is the era for which they are still best remembered. Books That Rock: "I Am OZZY"
Ozzy Osbourne's autobiography is the long awaited story of Ozzy's roller-coaster career as seen through his own eyes. Raised in poverty in Aston, Birmingham, England, and being a social outcast since his early childhood school days, Ozzy's highly unlikely rise to success in Rock N' Roll music is a fascinating story from page 1. Even more amazing and unlikely is the fact that he survived all the self-abuse he caused himself through his numerous harmful addictions and erratic, appalling behavior. At this point in his life he has the perspective to look back on his life objectively, and he does so with humble & often brutal honesty. Reluctant to take credit for many of his successes, he never passes up an opportunity to thank those who have helped him out at the various stages of his life when he otherwise would have failed, or gone to prison, or been harmed, or may have died. He is not one to carry grudges, and has something good to say about almost everyone he's crossed paths with. From a fan's perspective, I'm thankful to him for sharing his life-story with us. The context it brings to the music makes the songs more memorable. Some songs that I had almost ignored before, I now consider favorites. Others that I enjoyed for years are given more dimension by the events that gave rise to them. From his years with Black Sabbath, to his remarkable solo-career, the Osbournes & Ozzfests, my fanaticism has been fully rekindled. Ozzy also mentions several musicians that have inspired him throughout his career. First and foremost are The Beatles. Led Zeppelin & Jethro Tull were other popular bands in the early days of Sabbath. One of my favorite passages was where Ozzy asked Tony Iommi if he'd heard the new Led Zeppelin album, and if he could believe how heavy it sounded. Tony casually replied, "We'll be heavier." 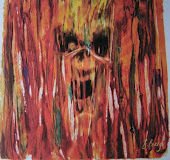 Ozzy also recalls the turbulent 80's with every appropriate emotion. The tragic death of Randy Rhoads, the 'Suicide Solution' lawsuit, the chaotic tour with Motley Crue, the biting-off of heads of bats or doves, the substance abuse and rehab.... Everything you've ever heard about Ozzy is put in perspective by the man who lived it. Check out this book & read it. Your heavy metal IQ will thank you for it! I'm just checking in to update you on my next planned series of poll topics for this summer. You may recall last summer the monthly poll topics followed the theme of '80's Heavy Metal Icons', as each month you voted for a favorite album from the 80's by various metal bands. In a similar fashion, this summer's theme will be favorite albums form the 70's! The first band will be the mighty Led Zeppelin (I will include their 1st two albums in the poll, even though they were released in '69), and I'll pick a different 70's hard-rock or metal band for the next few months. I may not include bands from that era if I've already reviewed their 70's material. However if you have a favorite band from that decade you'd like me to include in this series of readers' polls, by all means feel free to suggest them to me. Just leave a comment on this post, or contact me by any means if you know where to find me!